To me when I set the data logging threshold to 50 cpm it should only record data at least 50 cpm. If it actually records data that is only 50 cpm then that would be useless but it doesn�t even do that. It returns no results at all in the log. Why is that? I lost 2 days of data that I was hoping the counter will only save data that is at least 50 cpm. I got nothing!!!!! How many more problems will I discover before you guys fix everything? Really how many? This detector is becoming more useless the more I explore it�s features. I just tested my 500+ and found that it correctly saved values over the threshold and not when under. However, I also noticed that at some points the �Sv/h value was not at the expected ~0.6, but was at something around 400000 ! And was also read out by GeigerLog as that. It went back by itself to the ~0.6 after some time. Perhaps in your case such a strange setting lasted for 2 days? P.S. do you remember whether you used the threshold mode "CPM", or "�Sv", or "mR"? I used CPM and did not touch the other settings. Right now I have the CPM threshold the same way but I reduced the other thresholds to 0 and will test today. Can you actually set the three thresholds independently? With no help whatsoever from GQ Electronics staff I believe I have figured out what has happened to my counter. I believe that the data log has corrupted itself and I decided to erase the data log in the device. I just did this this morning after trying different things on my own like different settings for logging. I will waste another day testing this today when I should have returned this unit to Amazon long time ago as GQ electronics as a company no longer appears to give a crap as there are several problems still unresolved that I posted about and no replies and that equals no solutions. But I want this to work when they just want to sell products that are not 100% working. I will reply here after my findings tomorrow or after that. You can try to put salt/banana near the sensor to reach 50+ cpm faster. Based on the user guide, the threshold saving is the device feature, not the software Data Logger PRO feature. So, if you enabled the threshold saving on the device, it only saves that data into device internal memory. The Data Logger Pro still works like normal and saves all data. To get saved threshold saving data, you need to download the data from device with Data Viewer software. Ulix, with threshold setting, it can not set independently. Also, you only can select one of those. The device firmware only uses the type you selected, in this case all others values are no longer important and will be ignored. There is no CPS used in this feature. Sonicmixmaster, your understanding is correct. The device only save the CPM exceed the threshold you set into internal flash memory. For a Every Second Threshold Saving mode, the device will compare the CPM every second. If that particular second CPM exceed the threshold you set, the data will be saved. For Every Second Threshold, it will save CPS (not cpm) when cpm >= 50. So it should be Every Minute Threshold to save the CPM when CPM >= 50. Yes. EmfDev is correct. But I think if save the CPS, should compare the CPS, not the CPM. you can see that periodically I do get a reading above 30 but this junk data logging does nothing. I now have reached the limit of my patience. Friday I will setup a return of this mostly useless device unless I have some immediate solutions here. I am extremely frustrated with this $300+ junk of a detector. This unit has genuinely pissed me off. I am really beyond my capabilities in what else I can try here. That's it I'm done!!!!!!!!!! That is really frustration indeed. But the problem can be solved for sure. The threshold saving only available on the device, not the Data PRO software. Did you download the .bin file? Can you post your .bin file? So that I can check. The .csv file is generated based on the .bin file. I did not use pro software. I used data viewer. Loaded the bin then saved data as csv. Your GMC device works PERFECT! The threshold saving feature works just like it was designed. When the .bin file loaded to the Data Viewer and play back, I can see your 30CPM threshold saving data started @ 08-28-2018 11:26AM. When I saves those data into .csv, it shows blank. That because the software expected more data, but the data is too short to save (Maybe at least 60 data for one row and a few rows needed). However, those short data should not be skipped and should be saved into .csv file too. The Data Viewer for sure will be improved on this in next version. Why limit the csv output? To me there is no reason for it to require more data for it to output it as you say. This is very stupid and whoever decided on this needs to be fired !!!!! I'm not sorry for saying that but I wasted a lot of my time and your software doesn't even show any error message why there is no output. This software is not user friendly at all when things do not work like they should. Even when downloading data from the device it shows a "Not responding" message in the title bar of the app window for a little while before the window closes itself. This appears like a poor way of coding to me. Don't you think that people buying these devices actually buy them to take them to a location and be able to save radiation levels in a way to be easily recalled into a spreadsheet for immediate analysis? And not to mention DAILY????? We want data analyzed each day!!!! Not wait to get a week of data and then maybe the software can output a csv for analysis. Also, why are there so many steps to get a csv out of the device? Download bin, load bin into app, save bin into csv. This should be done in one step !!!!!!!!!!!! Why can't I download the data in data viewer software and have it give me a choice to right away output to csv? I'm already using the same software that converts bin to csv so why the extra stupid steps? Am I missing something here? NO! The software is missing logical functionality, a lot of it actually. People buying these devices are not getting them for basic readings. I can get a basic Geiger counter for $70 online that will give me basic readings. I paid $300 + tax to get more and I am not getting it!!! People want to have detailed output with dates and times with as little clicking as possible. This is called making the device and software user friendly. The data I gave you has approximately 1 day of data in it. but I cant analyze the daily data because your software needs more data!! Is this really the reason? It really looks like you guys are still developing this device/software and using customers as testers. This is not right!!! I'm still going to return this on Friday as I am now fully convinced that what I purchased is an unfinished product that needs a lot more real world testing, feedback and repair from GQ Electronics. I am not an employee of GQ Electronics but I sure feel like one ever since I received this, except I'm not getting paid for testing it and feedback. When I purchased this I didn't think I would have to come on this forum and send emails telling you guys to fix problems that you failed to discover before your decision to release it for sale. What I have seen with this device is beyond disappointing. Too many things are not working correctly for this to be a reliable detector that can record readings in a meaningful way and easy for the user to use. So at this time I am speechless. I think I said all that I thought of. Thank you for your all feedback.I fully understand your feeling. Some of them are good points and true. But some points I do not agree with you. First, the GMC-600+ is the top tier GQ Geiger counter and it installed LND7317 Geiger Tube. The LND7317 alone cost $115. I do not think you can compare it with $70 Geiger Counter on the market. The similar Geiger counter in the market is ~$500-$800. The device itself so far has no big problem. Yes, the free software is not bug free. It always on the way to improve and needs changes due to the product hardware features improvement. The threshold saving feature on the device is newly added feature. This is why not yet completely work well with Data Viewer Windows software yet. In fact, you are the first user to use this feature on this PC software. Thank you for finding out this problem. For sure this will be fixed. The software development always accompanied with user feedback, bug fixes and improvement. That is the nature of the software. This is why we have so many different software version. Just like #1 software company Microsoft, they never stops software bug fixes, service pack related and new version Windows releases. They are doing those everyday. Otherwise they should keep their Win 95 till now. There is no perfect product exist, but only the best product. Fortunately, GQ is open, it always takes first consideration of feedback, criticize and then react fast . So that to improve their product to be the best one. This is why this forum here, you and other users here can criticize GQ products loudly and without scruples on GQ official website. No other Geiger Counter company does this. This leads me to believe the GQ products will be the best. Even though, I believe you still can return the product anytime to get 100% refund from GQ if you want. This is how GQ treats all customers. The big part of the 600+ is the tube. I know that. That is why I got this instead of the 500. I want it to be sensitive enough for me to be able to leave it in my pocket and discreetly monitor radiation without anyone I work with knowing about it. But what good is that if 99.99% of the data is background radiation that at this time your software will not let me filter? You basically mention that the free software needs work? Right? Sure I understand that. Well the free software is the only software you offer that lets me download the bin from the device without setting it up for periodic data download (every 30 seconds or so) I don't need the data downloaded every 30 seconds. I want to plug it into the computer and download it and then analyze. You guys gave me the Pro key and although the free and pro look similar the pro doesn't have a download button but if it did it should let you save the bin straight into the csv with one click like I mentioned above. As a matter of fact both free and pro should do this to eliminate the 3 steps it needs now. And if you want to make the device less cumbersome to use make the software on computer be able to adjust ALL settings on the device so those hard to press buttons on the device don't break or cause finger fatigue to your users. Once the device is recognized in windows after installing the drivers the software should let me configure every aspect of it without touching the device itself. You already have that capability partially enabled. Also, you still haven't mentioned why there is a limit on the amount of data in the bin before the software can output it to csv. Oh and I know the tube is expensive. What I was saying is that cheaper counters just display the readings live without having the capability of logging data to be analyzed later with software. That is why I bought this one. Yo log data. You said it yourself the 600+ is the best!!! But not really considering it glitches on the readings once in a while with a CPM pf 128 or more and doesn't allow me to filter out background radiation levels so I can focus on the important high cpm data gathered during the day. Tested the current released Data Viewer, save to .csv file can be done right after the .bin file been downloaded. You do not need to reload the .bin file. The problem of blank threshold saving data in .csv file has been found. That because the threshold saving data type not been added the software yet, so the software does not recognize the that data. We have built a new TESTING software for you, you can test it to see if it works. Remember, this software is not an officially released verion, it is a testing version, it may have bugs. Also, saving the threshold data into .csv is complicated than expected. Because the timestamp is no longer continuous. That will causes the timestamp and total CPM data no longer accurate in the .csv file. We need to think about this and to find a way to represent this kind of data in .csv file. Your downloading into .csv file suggestion makes sense. Some user may not interested in .bin file instead of .csv. So the new software added saving both files at once when you downloading the history data from the device. If you have any other idea on the software you can post it here. Thanks for putting some effort to resolve the problems I mentioned. I will not be able to test this TESTING software version today but will do soon. I am however willing to spend a few minutes give you some ideas for the software improvements. I would start off by having the pro version have all the features of the free like the download data button right on first screen. Also make the text dynamically resize itself depending on the DPI set in windows. To see better on my monitor I increased the dpi to 150% and some text gets hidden in the frames of the application window. Also the window in the software allows resizing but the content stays the same, it does not stretch to the right. It would be good to have the content on the main graph window resize the graph like Microsoft did in windows task manager performance tab that lets you view for example a longer history display of cpu usage graph. These quirks came to my mind right now and noticed them fairly quickly after starting to use the software when my counter first got delivered and I started using it. Thanks, we will take a look into this. The Data Logger PRO is not specifically designed for GQ GMC products. It is a generic software for all different band Geiger Counter. Only GQ products has history download feature, so the Download button only exist in Data Viewer software. 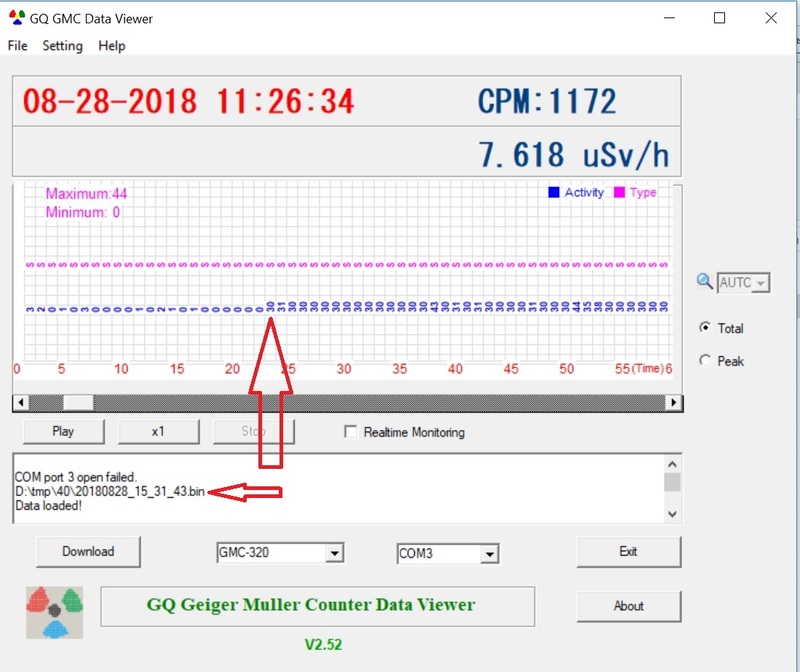 The Data Viewer software is specifically designed for GQ GMC Geiger Counter for free. I took a week off away from this nonsense as I was getting too frustrated. Today I tried a week+ of data at every minute intervals with threshold of 30 and still got NOTHING with old viewer software 2.52 although I see regular CPM of above 30 on gmcmap. So that not enough of data is not correct what you said last time. Really? How much data do you really need for the software to be able to process it? I think there is something else wrong with that version and I would like to know so please tell me. Your reasoning does not make sense that there is not enough data for old viewer to process. I did however try the TESTING version and it seems to display data for the past week although not accurately. I will post about that later when I have tested it for a bit longer. So it appears that once again another software update (although for TESTING only) uncovers another problem. I really am convinced that when you guys fix something in the software something else gets broken. I have an idea that may help you make quality products. How about each time you release a new version you test EVERY function of it before you release it. You still prefer to use customers for testing it seems. And don't forget as I have to remind you again! WE DO NOT WORK FOR GQ Electronics LLC! Testing should be done at your locations with your employees! We're really sorry for the inconvenience. We will fully test the software tomorrow and will give you the final version when finished. Thank you. Sonicmixmaster, thanks for the feedback. Why you use released 5.25 to test the threshold saved data? Like what I replied you on #17, "The problem of blank threshold saving data in .csv file has been found. That because the threshold saving data type not been added the software yet, so the software does not recognize the that data." The only version fixes threshold saving data is the TESTING version with inaccurate timestamp. We are working on that and not been released yet. Basically the threshold saving data is the new feature just added since last week and not been released the software yet. The testing is still on going. Since the software is free, GQ encourage any users to test this TESTING version, and report bugs to GQ. So far GQ has not receive any report of feature broken in TESTING version. I used 2.52 because originally this worked showing data that was appear to be corrupted but data corrupted at the end of the log. But since I cleared all data in the device it stopped showing anything. If you guys fix the correct time stamps I can finally begin to use the device for what I bought it for. I noticed one thing that may or may not cause problems. When I use the TESTING version it shows "downloading data from GMC-300. I have 600+. Your software is not detecting what device I am using correctly when I download data. I also just noticed a problem with data saved every second. It shows the total CPM very high. 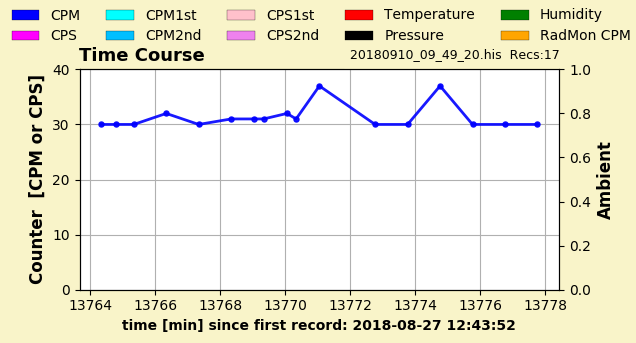 If you look at the data between September 8 and September 10 you will see very high CPM. The GMC-300 being displayed can be fixed fast..But is it just the timeStamp you want to getfixed now? 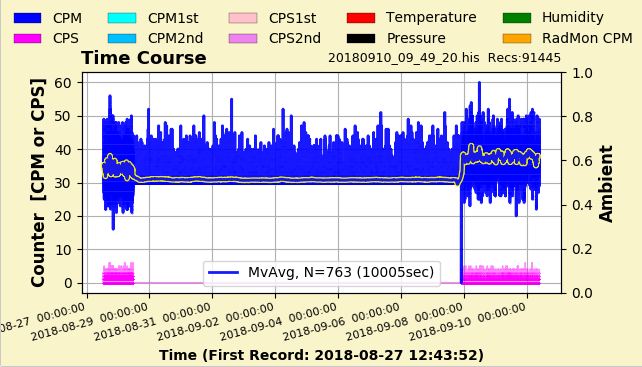 The high cpm count looks like the data is saved per minute and then the cpm gets the total of 60 of those. Does the threshold show now if there's only few data? I just want reliable readings at the correct time and be able to filter out readings that are normal that come from space or whatever. That is what I wanted to use the device for from the very beginning when I received it. If you can accomplish this then I will never post on this forum forever. It was mentioned that the software is free that users should submit problems with it. Well you offer a geiger counter that logs data, correct? I would love to get any software whether or not it is free that is reliable. Do you offer a paid software that will allow me to reliably view the data from the device you sell? Here is a result on your own data (you linked to in your reply #23) analyzed with my free, open sourced GeigerLog software https://sourceforge.net/projects/geigerlog/. The normal saving is that the counter saves a "Date&Time Stamp" followed by e.g. some 200 CPS values. These values are single bytes as long as their value is below 256, as is the case for background measurement. The Date&Time Stamp is 12 bytes long. So, on average one data point takes (200*1 +12)/200 = 1.06 bytes. However, when you activate the threshold saving feature, each value might need its own stamp, since otherwise you will not know at what time it occurred. Thus a value may now need ( 12 + 1 )/ 1 = 13 bytes, or 12 times more storage memory! Generally you will store more economically by NOT using the threshold feature! You can see clearly when the threshold saving feature was activated, and when recording took place as CPS and when as CPM. Within the blue area are thin yellow lines, which show the limit of the Moving Average. You see the jump in this average when going from no threshold to threshold and back. Which means now you can't even determine a proper average, and there is no way back! You have lost information. In summary, forget the threshold saving feature, it is irrelevant. 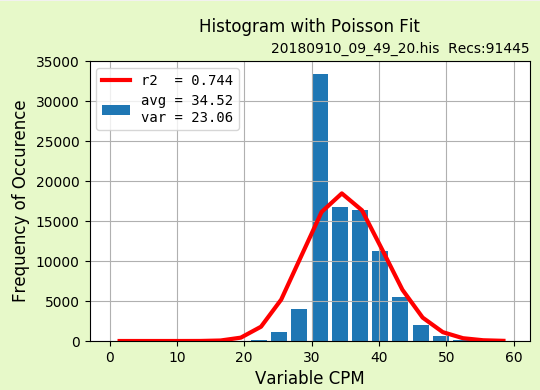 If you want to detect rare events of whatever kind, use regular "CPM, save every minute" feature, record for long times, and you might still need the Moving Average to investigate if anything is just part of the randomness of radioactive events or a true discovery of something unusual. I wanted to use the threshold feature and the ability to save readings every second simply for getting readings that matter at my job where I operate or work near various machines that contain radioactive components. I can later compare my counters readings with security camera time stamps and narrow down if and where a radiation leak may be present. I cannot walk around everywhere holding the detector as that would interfere with my job duties. But if I have the detector in my pocket recording data every second and at the same time filter out background radiation that would allow me to use the data more effectively. For example on a typical day I come home, plug the counter into my computer download the data and see that at 10:35 am I have a reading of 200 cpm, now I can see the exact time and be able to find the same time on the security video computer and now I will know that that particular location has a somewhat unsafe working condition due to radiation leak. According to the capabilities of the detector I should be able to achieve that. You are telling me that maybe I am trying to save memory space in the device. You completely missed my intentions for the use of the device. I purchased the 600+ because of the higher sensitivity of the tube which will help me keep the device in my pocket without anyone knowing that I have it and still be able to generate data while I work in locations containing machines emitting radiation. Of course the machines are supposed to be safe but I cannot trust my employer 100% with monitoring radiation levels on a regular basis. I am taking the safety of working in locations containing radiation into my own hands and want recorded proof if there is an unsafe working location so I can let them know and protect myself. That is why having precise data logged every second important to me and filtering out the background radiation will allow me to analyze the data better. Set your device saving mode on Every Minute Threshold. That will save the CPM every second once the reading exceed the CPM threshold you set. I think this feature meet your need. The version 2.54 has added the Threshold Saving download into .csv file.